Alfred Giles was born at in Middlesex, England, on May 23, 1853 . At 17, he apprenticed at an architecture firm in London for two years. In 1873 he emigrated to the United States, settling in Texas in 1875. 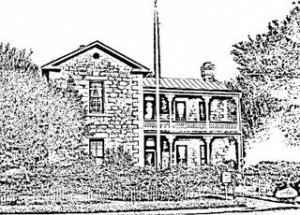 When he started his own architectural practice in San Antonio in 1876, Reconstruction was coming to an end in Texas, and soon, Giles’ business was booming. Giles designed buildings all across the Hill Country featuring local materials, mainly stone. The William Bierschwale House was started in 1889. William was County Clerk and a was elected as a Representative to the state Legislature.